Kuribayashi, later Petri, was a Japanese camera maker. Most sources say that the company was founded as Kuribayashi Seisakusho in 1907 by Kuribayashi Yōji (栗林庸二), manufacturing tripods and dark boxes. Its first camera was the Speed Reflex, supposedly released in 1919. However, a Petri catalogue dated August 1981 reportedly says that the company was founded in 1918 and that the Speed Reflex was introduced in 1922. The Kuribayashi company had an address in Adachi (Tokyo) in 1943. It is said that this was only the second factory, the offices and main building being in Shitaya (Tokyo), and that this Shitaya building was destroyed by an aerial bombing in 1945. The company changed status in 1949 and became K.K. Kuribayashi Shashin Kikai Seisakusho (㈱栗林写真機械製作所) in 1949. At that time the headquarters were in Chiyoda (Tokyo), and the plant in the Adachi factory mentioned above. The company did not renew its cooperation with Minagawa (owner of the name "First"). It had to look for another brand name and finally settled on Karoron and Petri. Kuribayashi made a range of 4.5×6 folders under these names and a single 6×6 TLR model called Petriflex. Its first 35mm camera was released in 1954 and its first 35mm SLR in 1959. The company became Kuribayashi Shashin Kōgyō K.K. (栗林写真工業㈱) in 1956. In 1962, it took the name of its products and became Petri Camera K.K. (ペトリカメラ㈱). 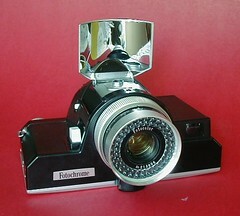 In 1968, it released the Petri Color 35, a very compact camera said to be inspired by the Rollei 35. Along with its line of 35mm rangefinder and SLR cameras, Petri also sold movie cameras and binoculars. The Fotochrome is usually identified as a Petri manufacture but in fact, there is little evidence for this. It's more likely that it was made by Copal as that company sued Harrison Fotochrome in the late sixties for payment for the manufacture of a camera in the mid-sixties. Fotochrome had refused to pay as the cameras were late (not timely) and mostly defective. There is no record of Fotochrome commissioning any other camera. Copal won the case in 1971 but by then, Fotochrome had filed for Chapter 11 protection. Petri Camera went bankrupt in 1977 or 1978. It was revived as Petri Kōgyō K.K. (ペトリ工業㈱) but it abandoned camera production some time thereafter. It seems that the company still exists (2009) and makes telescopes. The company seems unrelated to the current Kuribayashi Seisakusho Co., Ltd. founded in 1944. ↑ Baird, p.11, Lewis, p.184 and this page of the Japan Memory website. ↑ Baird, pp.13 and 40–2. Lewis, p.36. ↑ See this page by Sumida Petri-dō. ↑ Date: Baird, p.15. Baird gives Shashin instead of Shashin Kikai. ↑ Baird, p.15, suggests that First Camera Works was a manufacturing company jointly owned by Kuribayashi and Minagawa, but it seems that no actual company had this name. ↑ See the First Six and Firstflex leaflet reproduced in butkus.org's Orphan Camera website. ↑ This address was Tōkyō-to Adachi-ku Ueda-machi 1807 (東京都足立区上田町1807). Source: "Kokusan shashinki no genjōchōsa" ("Inquiry into Japanese cameras"). ↑ Transition visible between two advertisements dated 1949 reproduced in Kokusan kamera no rekishi, p.178. Baird, p.30, omits the word "Kikai" by mistake. ↑ The address of the office was Tōkyō-to Chiyoda-ku Kanda Nishiki-chō 3–16 (東京都千代田区神田錦町3の16). The plant was at the same place as before, but the address was now Tōkyō-to Adachi-ku Umejima-chō 1807 (東京都足立区梅島町1807). Source: advertisements dated 1949 reproduced in Kokusan kamera no rekishi, p.178. ↑ It is listed in this page, dated 1 June 2009, of the Japan Telescope Manufacturers Association. ↑ See the chronology of the company's website.